Before arranging a meeting with a Kremlin-connected Russian lawyer he believed would offer him compromising information about Hillary Clinton, Donald Trump Jr. was informed in an email that the material was part of a Russian government effort to aid his father’s candidacy, according to three people with knowledge of the email. The email to the younger Mr. Trump was sent by Rob Goldstone, a publicist and former British tabloid reporter who helped broker the June 2016 meeting. In a statement on Sunday, Mr. Trump acknowledged that he was interested in receiving damaging information about Mrs. Clinton, but gave no indication that he thought the lawyer might have been a Kremlin proxy. Mr. Goldstone’s message, as described to The New York Times by the three people, indicates that the Russian government was the source of the potentially damaging information. It does not elaborate on the wider effort by Moscow to help the Trump campaign. It's that second point that might keep Trump allies up at night; you can bet that if warring factions within the administration are nervous or fractured enough to be leaking damaging information to the press, Robert Mueller is probably getting an earful, too. I added that it's premature to treat this as a four-alarm fire based on the available details, but that the "nothing to see here" spin also seems to have evaporated. It also sure would be nice to actually see the widely-discussed email in question, as was the case with the still-unseen Comey memos. Trump Jr's attorney issued a statement that side-stepped the heart of the Times story: The email. In addition to the analysis below (which was written before last night's report was published), the apparent development that Donald Trump's son was made aware of the forces behind the June meeting before agreeing to it adds a significant new wrinkle to the overall story. Obvious follow-on questions include whether Kushner or Manafort knew about the backdrop to this discussion, as Trump Jr. allegedly did, and whether the my third point above is plausible. So Goldstone did not even know if it was true? He might not have even had direct knowledge of the origin of the damaging material? But the Times just reported Goldstone said it was the Russians. So he might not have really known who it came from but the Times is asserting it as factual that Goldstone definitely told Trump, Jr. the Russians wanted to help his dad and had damaging material about Hillary Clinton? Hmm. By the way, even if additional evidence emerges that this amounted to collusion, sordid and craven conduct isn't necessarily a crime. On the other hand, the collapse of the endlessly-repeated "no collusion" assertion from all of Trumpworld would deal a devastating and lasting blow to the White House's credibility. Some on the Left are hyping these developments as back-breakers. That's hyperbole, and we'd all do well to await more context details. But based on what we've learned so far, simply shrugging this off as "fake news" requires blinders and a heavy dose of wishful thinking. 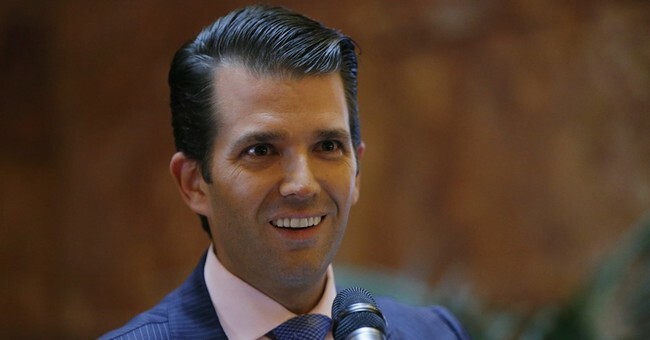 "I was asked to have a meeting by an acquaintance I knew from the 2013 Miss Universe pageant with an individual who I was told might have information helpful to the campaign," Donald Trump Jr. said in a statement received by ABC News. "I was not told her name prior to the meeting. I asked Jared and Paul to attend but told them nothing of the substance. We had a meeting in June 2016. After pleasantries were exchanged, the woman stated that she had information that individuals connected to Russia were funding the Democratic National Committee and supporting [Hillary] Clinton. [Veselnitskaya's] statements were vague, ambiguous and made no sense. No details or supporting information was provided or even offered. It quickly became clear that she had no meaningful information," Trump said. Trump said that she then changed the subject and began discussing the adoption of Russian children and moved the conversation toward the Magnitsky Act, a 2012 law that bars certain Russian officials' entrance to the U.S. and their use of the U.S. banking system. After the act was passed, Russia stopped allowing Americans to adopt Russian children. Veselnitskaya is best known for her work against the Magnitsky Act. "It became clear to me that this was the true agenda all along and that the claims of potentially helpful information were a pretext for the meeting. I interrupted and advised her that my father was not an elected official but rather a private citizen and that her comments and concerns were better addressed if and when he held public office," Trump said in his statement. "The meeting lasted approximately 20 to 30 minutes. As it ended, my acquaintance apologized for taking up our time. That was the end of it, and there was no further contact or follow-up of any kind," he said. Trump added that his father knew nothing of the meeting. A few thoughts: First, this is at best unflattering and problematic for the Trump administration. The President, Vice President and others all repeatedly denied that anyone within the campaign had met with any Russians, a blanket assertion that hasn't held up. What they might have meant was that nobody in their camp ever colluded with the Russians -- the central allegation that has never been proven -- but a number of unreported meetings have come to light over a span of months, forcing a string of senior administration officials to revise inaccurate disclosure documents and statements. This June meeting involving Trump Jr. is another billow of smoke the 'smoke means fire' crowd can now cite. Ukrainian government officials tried to help Hillary Clinton and undermine Trump by publicly questioning his fitness for office. They also disseminated documents implicating a top Trump aide in corruption and suggested they were investigating the matter, only to back away after the election. And they helped Clinton’s allies research damaging information on Trump and his advisers, a Politico investigation found. A Ukrainian-American operative [Alexandra Chalupa] who was consulting for the Democratic National Committee met with top officials in the Ukrainian Embassy in Washington in an effort to expose ties between Trump, top campaign aide Paul Manafort and Russia, according to people with direct knowledge of the situation...She occasionally shared her findings with officials from the DNC and Clinton’s campaign, Chalupa said. Nevertheless, repeated amendments of the record and evolving accounts triggered by journalists dragging new details into the sunlight is not a good look for Team Trump. Even if they are innocent of the underlying 'crime,' (which is still collusion, despite all of the misdirection and mission creep), it's increasingly clear that they've presented an incomplete picture to the American people on these issues, whether through deliberate intent, or mere sloppiness. This at least gives the appearance of incriminating evasiveness, and suggests additional avenues of investigation for Robert Mueller's special counsel probe. I should also note, in fairness, that forgetting about relatively brief or inconsequential interactions with foreign nationals -- or even high-ranking officials -- is not necessarily evidence of nefariousness. Just ask Democratic Senator Claire McCaskill. Finally, one irony here is that the information that was supposedly teased as a means of securing the Trump Jr. meeting in the first place involved an allegation that the Russians were bankrolling the Democrats, which Trump's team evidently believed could be used to attack Clinton. That would have been an...unusual strategy for campaign officials who were themselves coordinating with the Russians, no? That's an exculpatory question. I'll leave you with a less forgiving one: Are we supposed to believe that Trump's son and inner circle met with a woman promising delicious morsels about Hillary without the candidate ever knowing or hearing about it?